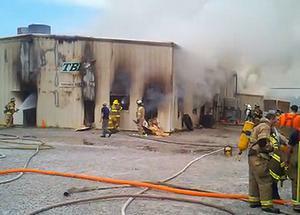 SUMMITVILLE, Tennessee, August 1, 2011 (ENS) – Cleanup was underway Sunday at Tennessee Bio Energy after a massive fire at the biodiesel plant. The plant is located near Manchester in the south-central part of the state, about 50 miles southeast of Nashville. A spark set off an explosion just after noon on Saturday and flames engulfed the building for eight hours, while more than 100 firefighters worked to control the blaze. The two employees inside escaped alive. One worker was injured and was taken to the hospital, where he was treated and released. The plant produces B99 and B100 biodiesel from used vegetable oil. It also produces refined glycerin. Since thousands of gallons of volatile chemicals like methanol and glycerin were inside, nearby residents in about a dozen homes were ordered to evacuate. Those residents have now been allowed back into their homes. Officials said about 30,000 gallons of methanol was consumed by the fire. Environmental crews are on the scene to assess the damage. Fire officials are still investigating the cause of the blaze, but plant workers tell local media it was an electrical fire.